UPDATE : June 6, 2012 : Due to a change in the Justin.tv APIs, this extension no longer works with Twitch.tv accounts. I have created a new extension, called Twitch Live which works with Twitch.tv accounts. Sorry about the hassle. Since I started playing Starcraft 2, I have become a pretty big fan of e-sports, and in particular, of watching streams of games. The most popular site for streaming is Justin.tv, where you can find tons of high level gamers streaming their gameplay. However, Justin.tv's site does not make it easy to find out which of your favorite streams are live at any particular time. 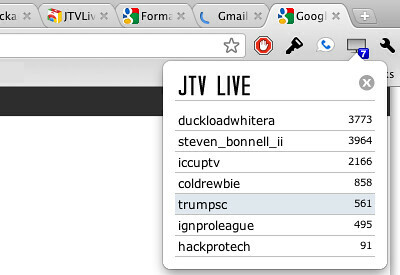 So, to solve this problem, I created JTV Live, a Google Chrome extension for helping you track which of your favorite Justin.tv streams are live. Using the extension is pretty simple. Once you install it, a small TV / Monitor icon will be placed in the top right of your browser bar. Right click on the icon, select options, and enter your Justin.tv user name. Once you have done this, you can click the icon, and it will show you a list of which of your favorite Justin.tv streams are currently online as well as how many people are viewing each stream. Big thanks to Ben Griffith for working on the design of the extension and creating the icon. If you run into any issues, or have any suggestions please post them in the comments.